8. Lewes History Group Membership: your last email Bulletin? Mention of Lewes these days does not conjure up images of an industrial town but, during the years that preceded and followed the Industrial Revolution, Lewes might genuinely have been described as a hive of industry. In this talk, John Davey will trace the 19th century growth and the 20th century decline of the manufacturing industries that – for 100 years – provided employment for most of the menfolk of Lewes. This oil painting of a scene at Lewes Cattle Market in 1937 is by James Bateman (1893-1959). It was presented to the Tate Gallery in 1938, but is not on display. James Bateman was the son of a Lake District farmer and initially studied sculpture, but after a serious injury sustained in the Great War had to switch to painting. He studied at the Slade after the war, and then became an artist and art lecturer. He is particularly known for his paintings of cattle. Click the cropped image to view the entire painting. On the left is a seemingly straightforward view taken from outside No. 7 Chapel Hill, looking up in the direction of the Golf Course. But if you were to stand on this spot today you will see that, although it is instantly recognisable, almost nothing remains the same. The nearest cottages are now painted white and the facing cottage now has a simple hedge and no creeper. 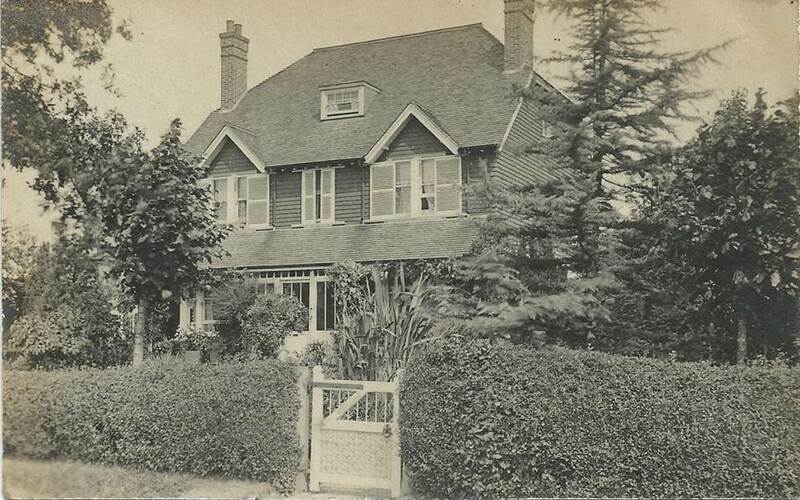 But most noticeably the cottages at the far end of the terrace are no longer three-storey gables. 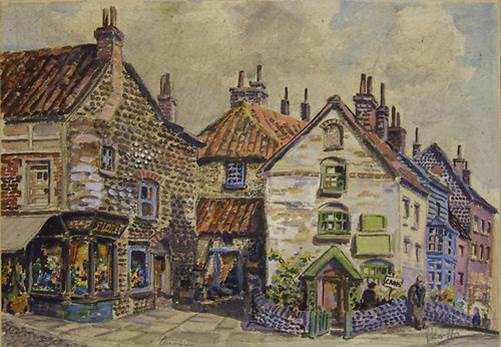 The watercolour offered on ebay recently featuring three-story cobbled houses and titled “An Old Part of Lewes” [Bulletin no.31] has not been recognised as a local scene. 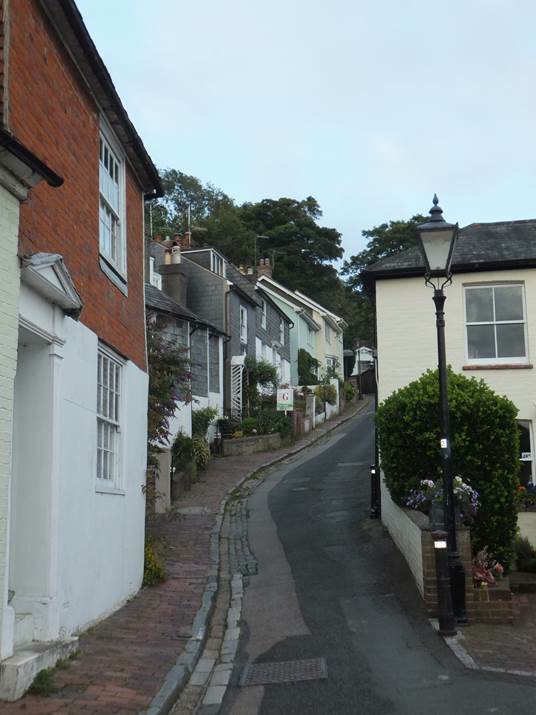 Cobbles are sometimes used in Lewes cottages, but rarely on houses of this scale. However, both Ron Gordon and Marion Smith have suggested that the scene is much more likely to be somewhere like Cromer or Holt in Norfolk. Ron noted that the house in the foreground appears to be offering crabs for sale. Just shows you not to believe everything you read on ebay! How William de Warenne, son of John, Earl de Warenne, was intercepted and cruelly slain on his way to a tournament at Croydon, Surrey, in 1286. ‘Twas a goodly sight to see. Were bursting on his view. And his Lady’s dream came true. 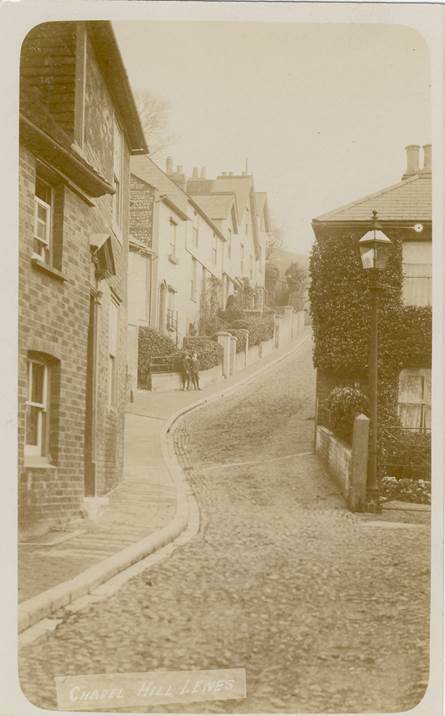 This image is from a postcard mailed from Lewes in 1912 and recently offered for sale on ebay. But is it a Lewes house? Can anyone identify it? John Holland & Brian Taylor will be speaking at 7.30 pm on Sunday 31 March at the Linklater Pavilion, Railway Lane, at a fundraising event for the Railway Land Wildlife Trust. John’s father was a Lewes railwayman who had an allotment in what is now Court Road, and John spent much of his early life there, watching the shunting in the goods yard nearby. Brian Taylor is a railway model maker. Tickets from info@railwaylandproject.org or on the door. Now that the Lewes History Group has now become a formal organisation, with a membership list that has already reached 80, from next month onwards this Bulletin will be distributed only to members. We will, however, continue to circulate details of events to everyone on the current email list. If you are not yet a member, but would like to become one, please sign up at our next meeting, or send a cheque made out to “Lewes History Group” to our membership secretary, Neil Merchant. Please contact Neil for his address. Membership is £8 p.a. for the first member at each address and £4 p.a. for additional members at the same address. This entry was posted in Art & Architectural History, Biographical Literature, Lewes, Local History. Bookmark the permalink.